I couldn't be more excited about adding Porter to the herd sire line up here at Ivory Oak! I had been eyeing the infamous Val/Rock Hard breeding for several years, but wasn't planning on adding another buck this year. It was fate that Porter joined the herd when he did! 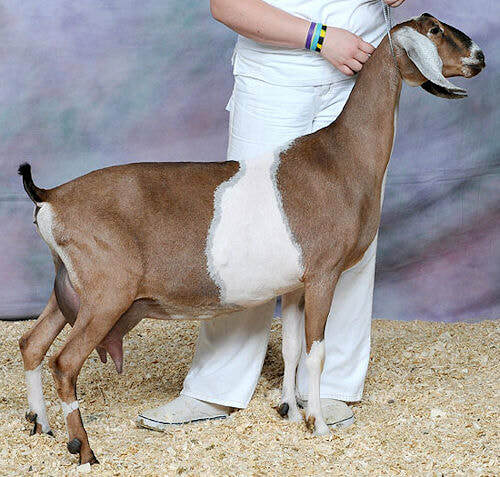 Porter is exactly what I would expect from this breeding; tall, long, upstanding. He has fabulous breed character and a high eschutcheon. Just this year (2018) his genetic full sister SGCH Blissberry RH Vallelujah 7*M EX93 became one of only a select handful of Nubian does to earn an appraisal score of EX93. 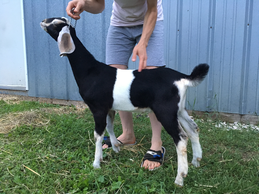 This Val/RH breeding has produced some stunning Nubians and I am very excited to see what Porter will bring to my herd.